Cleaning is a huge part of the world of hospitality, including Airbnb. We basically realized that this job requires that you become a professional house cleaner and laundry do-er. Many people hire these jobs out, we do not. 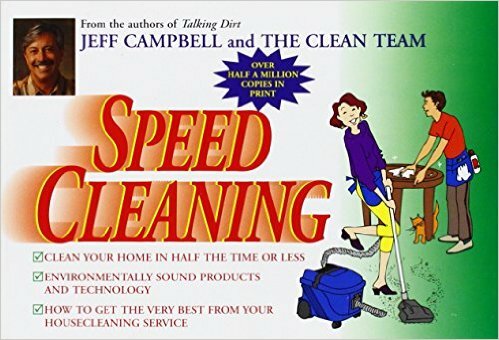 With the help of the book Speed Cleaning by Jeff Campbell, we've got an efficient system down to clean the entire house in under 2 hours. We are still learning the fastest ways to clean, but for now the system is working. See all the cleaning supplies we use and recommend here. This is awesome, I remember you both talking forever ago on your other blog, about buying the farm house and now you have it up and running... I looked at the pics and you've have done a great job on it... It's also in the :breadbasket of Virginia", with tons of civil war battle fields everywhere... I think I'll be booking a stay sometime in the near future... Hope you's had fun in NY... Keep up the podcasts and blogs. I listen all the time when i'm listing on ebay, or scanning or doing photos... You's both have 'in my opinion at least' the best of look on life and how to really live.. well this was long and not to sound to much like a fanboy.. but just keep it up and thanks for all the great content!!!!!!!!!!!! Good luck on this new venture. I'm sure soon it will be filled with other like minded souls. Me again. Just listened to the podcast. Enjoyed it more than I expected. My husband and I used to stay at hotels a lot and you're def right about not having things we needed or the checkout being too early. Good job with that! I was also curious if you tell ppl or have a small sign or note telling people they can use or eat what they see but not to take them. Some ppl may think they are your own personal items or something another guest left behind and they don't want to use it. And if they knew you put it out for them they may just take it home assuming it's a freebie. A suggestion though if you don't have one already is to leave them a cork screw bottle opener. We once bought a bottle of wine and realized we have no way of opening it. We drove all over town looking for one. Finally found a fancy overpriced one at Pier 1 which broke a few days later. Anyway, great podcast guys. I can always use advice on better ways to clean. when we give them the tour, we tell them they can use anything in the house, it's all there for them. if they use it all, we just replace it. no one has just taken stuff outright, they just use it and if it runs out, we grab the replacement in our storage. no biggie. we have a full kitchen with bottle openers, corkscrews, etc etc. basically anything you have at home, we have it. we ask people if we're missing anything and we get anything they suggest. a friend said we needed a slotted spoon and measuring cup set (we only had the classic pyrex glass measuring cup), so we got those. and if someone tells us something broke, we bring a replacement to them. thanks for listening! p.s. i too have been in apartments with no corkscrew and a bottle of wine with a cork! and that is a bummer. so i made sure there were 2 at the house! I bet it's different depending on the guests you attract. If we were in a party area where we attracted groups of young people, I assume lots of items would disappear. But we're in an area that attracts families or couples who want to go hiking. They're adults and know how to respect the house and its contents. We also hate to stay in places that has signs and notes everywhere. We think a rental should be intuitive. So far, so good. A diy solution to the Swiffer wipes for hardwood floors: I used to use those as well and hated that they weren't environmentally friendly. I figured out that the microfiber cloths will fit onto the end of the Swiffer sweeper. So I use my vinegar/water spray solution and then use a microfiber cloth on the Swiffer to scrub the floors. Then I just wash and reuse. No more buying the wet cloth packs from Swiffer! Enjoyed the tips on cleaning. Not my favorite thing to do. I had to laugh when you started talking about Bon Ami. That's an old cleaning powder that is really great and I use it all the time, when I can bring myself to clean!! I was laughing at the way you pronounced it. I took French in high school and I thought I knew how to pronounce it the "proper" way. My mom corrected me to pronounce it the correct Southern way. Bon Am-EE. We Southerners sure know how to mangle foreign words. Love the new podcast and hope it works well for you. no matter how you say it, Bon Ami is great! i love that stuff. makes cleaning that much nicer. Just fyi I typed in shampoo booze as a keyword to see how your site is ranking. You are 23rd for those keywords on Google. You don't show up on Bing or yahoo. good to know. it takes time for google to rank new sites. we're going to post a new episode soon. the more you post, the better your ranking will be. it took us over 3 months to get a single comment on scavenger life when we first started, so this blog is far ahead of what i even expected. yes, they are great! we can't live without them. and the Speed Cleaning book is essential. i need to re-read it in fact. Oh yeah - the airBNB guidebook. It used to be printable, but still came out a mess layout-wise. We have so much turnover in terms of restaurants & bars closing & opening that updating the print out became impossible - I just kept crossing stuff out and writing new stuff in the margins. Now I have my attractions map completely separated from airBNB because no one ever signs into airBNB to check the map there. The easiest site I could find was an online wedding assistant called weddingmapper.com. Drag & drop, add descriptions, personal notes etc, easy peasy. Our guests tend to be younger and online-savvy, and tend to bring laptops or tablets on vacation with them. I put the link to the map in the Info Book and they can better understand where stuff is in relation to the house. People are LOVING this clickable map. It took me a full day to add everything I wanted, but it was so worth it and I can edit it easily. I tell all my host pals to give it a whirl. ah, cool. that looks like a great tool. insane to me that the airbnb guidebook is not properly printable. at least let us download a PDF of it to print. good tip, i will give it a go! I clean with a mixture that I make in an empty Windex-type spray bottle. It is a glunk of Ammonia with a squirt of Joy Dishwashing detergent, and then add water. It gets a bit sudsy if you add the Joy at the beginning, so I add it after the water, instead. I use it for all my bathroom surfaces and tile floors. My neighbors told me about this solution many years ago, and they called it "cheap and easy" which it definitely is! that sounds like a good combination, i'm going to give it a try! Hi, can you give some tips for dealing with renters with dogs? Things like extra fees, allowable breeds and ages, cleaning, etc? Have you modified your decor or other decisions to accomodate or minimize damage from pets? In a coastal beach town, allowing dogs is a huge plus. We allow renters to bring dogs. All they need to do is have a brief conversation about who they're bringing and that they understand our fear of a destroyed home. We dont charge extra. So far, we've had no issues at all. Remember that people with dogs treat them like children. These aren't wild animals that live in someone's back yard. Usually it's a small to medium size dog that lives inside with the owner. Renters agree to a $500 deposit, but this is for all renters (not just dog owners). If a dog caused damage, it'd just come out of the general damage deposit.